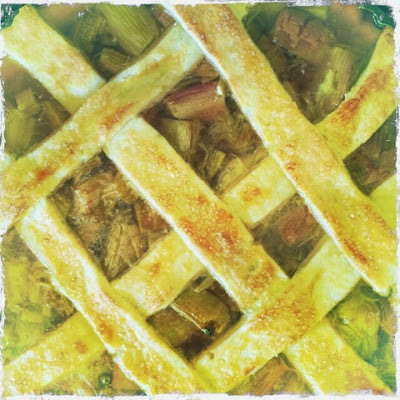 Francisco made the rhubarb pie from our first rhubarbs and shortcrust pastry. He put the rhubarb in water to a boil with sugar after taste. Do not let it boil. Take down the heat and add some potato starch. Put the sweetened rhurbarbs in the crust ( that has gone in to the oven by itself until it reaches a golden tone) and add some overlaying crust (that are brushed with egg yolk and spred with brown sugar) and leave in the oven at 200 ° until i gets the right golden tone and looks like this. 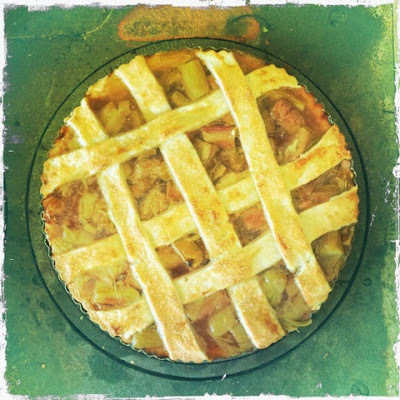 Welcome to rhubarb heaven.